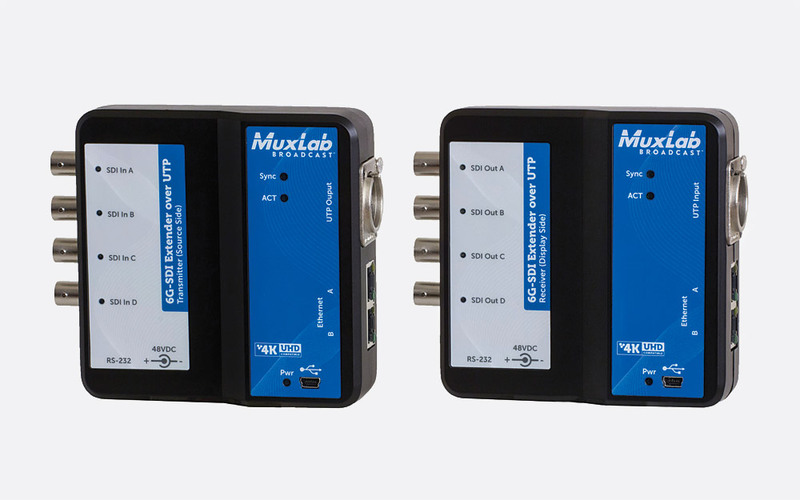 Intended for extending 'SDI based cameras or other SDI sources up to 4K resolution' over standard UTP cable, these MuxLab video extenders are typically used for movie production, studio video production and news media live reporting coverage. 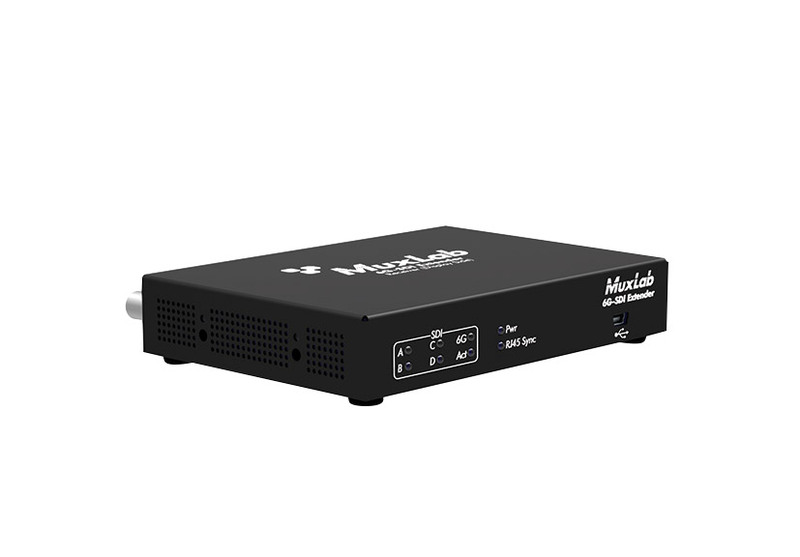 This 6G-SDI Extender over UTP will carry a 6G SDI video signal over up to 100 metres of cable between the transmitter and receiver with 4K resolution. A 3G-SDI or HD-SDI signal can be extended up to a maximum of 150m in 'long-reach' mode. Power is required by the receiver, which remotely powers the transmitter over the Cat5E/Cat6 cable. 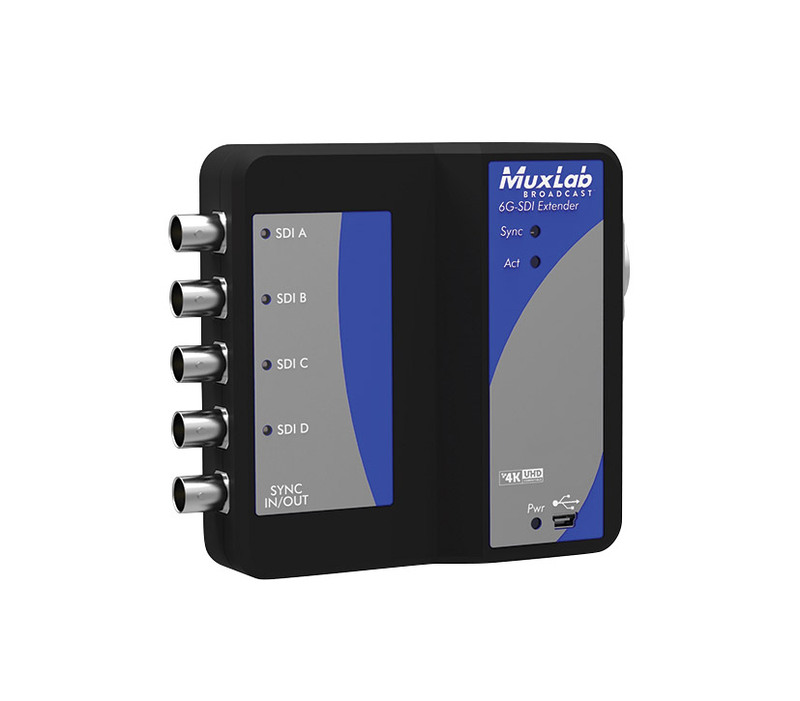 The input source for the transmitter is 'HD-SDI using single, two or four coax cables, 3G-SDI using single or two coax cables, and 6G-SDI using a single coax cable'. The kit 'supports all 6G channel configurations (1/2/4)', with a maximum supported resolution of 4096x2160 at 24/25 frames per second, 3840x2160 at 30 frames per second. SDI link recognition and configuration is automatic as is 'long-reach' mode, 150 metres, when a 3g-SDI or HD-SDI signal is detected. The transmitter has, on the front panel, five BNC connectors, for four SDI inputs and one sync connection. 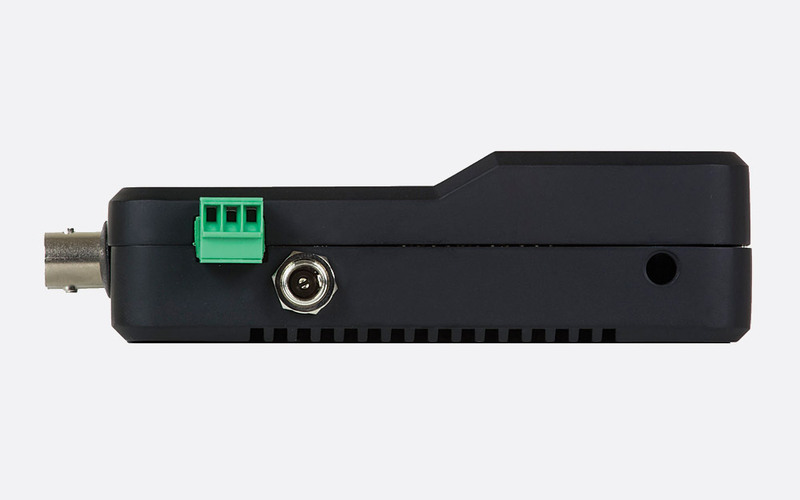 The rear has an Ethercon RJ45 socket for the UTP cable, while the top has a mini USB connection for firmware updates and control, as well as status LEDs for each of the four SDI connections plus 'Sync', 'Act' and 'Pwr'. It has multiple 1/4 inch threads 'for camera mounting or equipment attachment'. 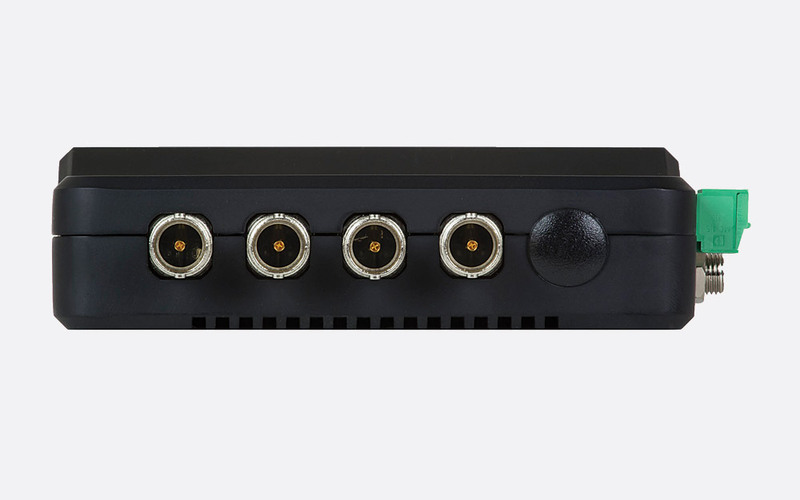 The receiver has four BNC connectors for the SDI outputs, plus one for a sync input connection, an RJ45 socket for the UTP cable and a co-axial power inlet, all on the back panel. The front panel has a mini-USB socket, for firmware updates, and status LEDs, one for each SDI channel plus '6G', 'Act', 'Pwr' and 'RJ45 Sync'. Supported modes: SMPTE 292M, SMPTE 296M, SMPTE 372M, SMPTE 424M, SMPTE 425M. Control: Serial console emulation with USB interface. Power source: 48V DC, 0.7A from included AC adapter. Dimensions: Approximately 110 x 110 x 32 mm, transmitter; 146 x 105 x 26 mm, receiver. Like the 500730, this is a 6G-SDI extender that works over UTP for distances of up to 100m between transmitter and receiver at 4K resolution. In 'long-reach' mode, a 3G-SDI or HD-SDI signal can be extended up to a maximum distance of 150m. 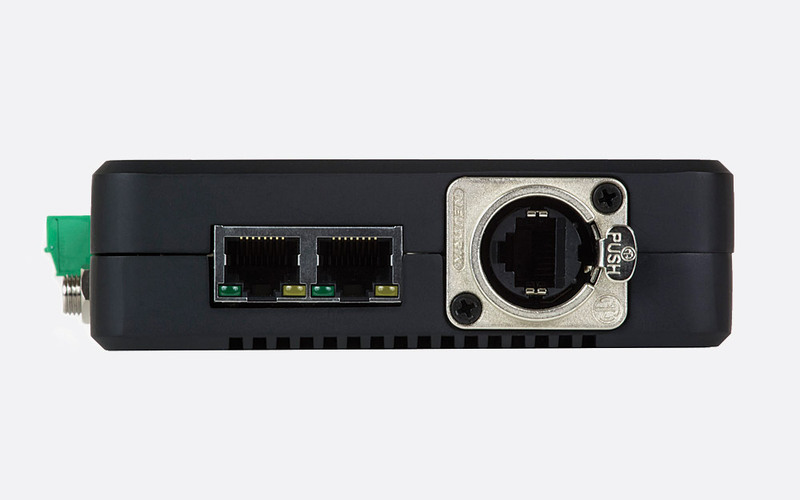 Supporting up to 6Gbps the 500733 can transmit and receive combinations of source including one 6G-SDI source, two 3G-SDI sources or four HD-SDI sources. 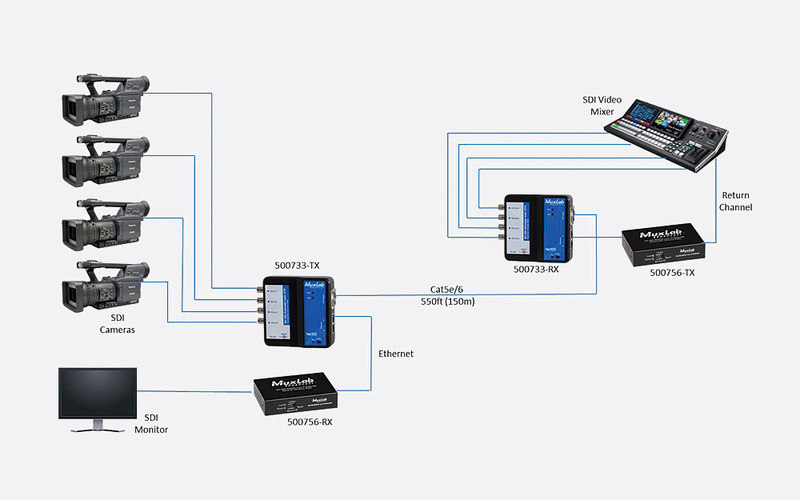 In addition, two Ethernet signals can be transmitted, which may be used as return channels, as well as a bi-directional RS232 signal pass-through for camera control unit (CCU) or tally light. 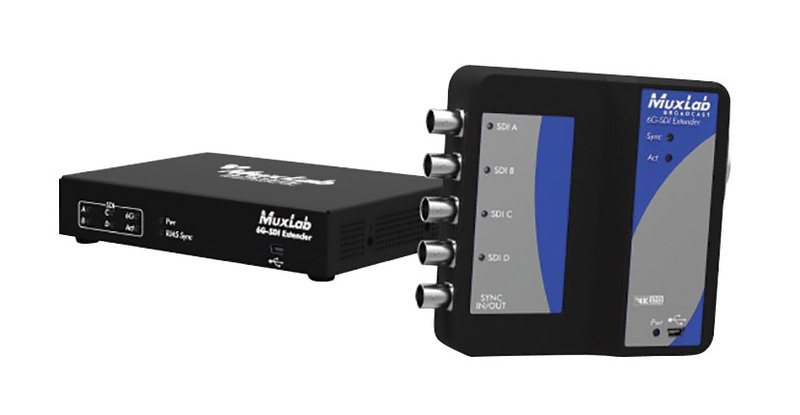 The transmitter has one 6G/3G/HD-SDI compatible BNC input, one 3G/HD-SDI compatible BNC input, and two HD-SDI compatible BNC inputs. Each input has an LED indicator that illuminates when a connected SDI link is established. An RS232 and 2.1mm DC power supply connection are located on the side of the unit with mini-USB port, for firmware update, and power status LED positioned on the top panel. The rear of the unit has a single Ethercon connector for UTP link and two RJ45 Ethernet ports. LEDs for 'sync' and 'ACT'. which illuminate to signify HDBase-T link and link traffic are detected. The receiver has the same connectivity and LED indicators as the transmitter. Although the receiver requires power from the included 48V DC power supply, the transmitter can be powered via POE from the receiver. An additional POE transmitter/receiver can in turn be powered by POE via the Ethernet 'port1' connection. Supported modes: SMPTE 292M, SMPTE 296M, SMPTE 372M, SMPTE 424M, SMPTE 425M. Serial console emulation with USB interface. Power source: 48V DC, 0.7A from included AC adapter. Transmitter and receiver dimensions: 109 x 109 x 25.4mm.